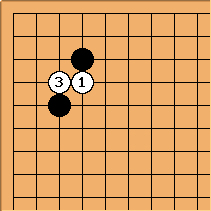 "There are no ko threats in the opening" is a proverb indicating that when a ko arises early in the game, it tends to be so urgent, that just about any ko threat has to be ignored. However, because "there are no ko threats" (that will be answered), a lot of moves, unlikely to be seen in other ko fights, are viable to gain some compensation for the loss of the ko. It is almost impossible to count this type of threat accurately, though by feel it is around 30 points (?). If W's position after winning the ko doesn't look that spectacular, consider that B has to take gote to follow through whatever threat he made (or else starting the ko was a total loss, without any compensation), so W will get to cut at a or engulf the corner on a large scale. From these results, it should be clear that the ko represents a swing of at least 15-20 points of raw territory in the corner for the winner (so 30-40 total swing) plus a ponnuki or two worth of influence. That influence is worth much more early in the game than in the final stages, after the fighting has cooled down and most of the board is settled. Meanwhile, the sorts of ko threats that exist in the opening tend to be worth less than the ko threats that exist later in the game. 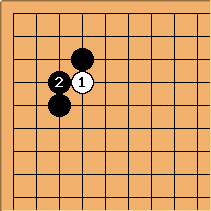 The reason for that is that stones, in the fuseki, tend to be more spread out. A ko threat like the one given as an example on this page, although it renders the victim's stones almost useless when followed through, still only affects two stones. Endgame ko threats often threaten to cut off huge chains of stones, kill entire groups, etc. Put these two together, and you find the reason (again, in my interpretation) for the proverb: as a general rule (exceptions exist, of course), the value (and number, though that's a different issue) of ko threats gets larger as the game goes on, while the value of the sorts of kos that get fought goes down. Therefore, there exists a certain point before which it is unlikely that one will find a ko threat larger than the ko (assuming the ko is one worth fighting at that stage in the first place). Hence "no ko threats in the opening." If I was to suggest a clearer phrasing for the proverb, I would say "There are no big enough ko threats in the opening," but I think it's fine as it is.